Please refer to our stock # 412 when inquiring. 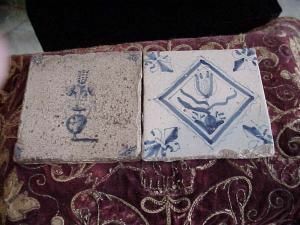 Tiles, Dutch. 18C. One with flower vase motif. One with flower in diamond shape cartouche. Both measure 5 x 5 in. Price is for each tile.